With 2016 entering its final stretch, the Twenty Twenty Analytics team asked ourselves: what have we learned this year? Well, I think the first thing we learned was that people get very upset over elections (Seriously, remember when social media was just cat videos and pictures of people on vacation?). But, fortunately, that’s not the topic of this blog. What the Twenty Twenty team was actually interested in was taking an aggregate look at the data that we accumulate, and drawing generalities about the state of Credit Union lending in 2016. With that in mind, we have examined our client’s collective credit and collateral data, and studied environmental elements such as housing trends and unemployment to get a feel for what we have learned in 2016. What have we learned? Credit and collateral trends are strong across all regions. The West appears to have the strongest credit and collateral quality, while the Southeast is a relative laggard in both categories. The Northeast, Mid-Atlantic, Plains, and Mountain states all trend somewhere in between. When considering 2016 lending performance, we started with considering trends within geographic regions. We decided to look at the regions as defined by the NCUA, which you can review here. 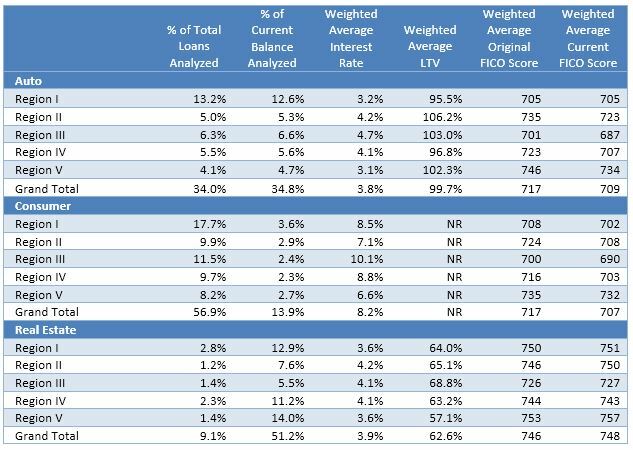 We found that, among our clients, the West’s (Region V) credit environment is stronger than all other regions by a significant margin based on originating and current FICO scores. The West also exhibits the lowest average real estate LTV’s and interest rates. This is likely because the real estate market in Western states (primarily California along with booming western metro hubs like Seattle and Portland) have exhibited some of the highest real estate values in in the country. Higher real estate values, result in larger loans, which theoretically results in more rigorous underwriting. This is supported by the spread between “% of Current Balance Analyzed” and “% of Total Loans Analyzed” in the table above. You can see only 13.6% of the total loans analyzed reside in Region V, however, 21.4% of the total balance analyzed is in the same Region indicating higher dollar loans in Region V, relatively. Conversely, the Southeast (Region III) exhibits, although still strong, far and away lower FICO scores than the rest of the nation, as observed in our data. In direct contrast to the West, the Southeast has relatively low value loans with 19.2% of the loans analyzed residing in the Southeast at only 14.6% of total balance analyzed. Interestingly, we observed that Original FICO scores appear, on average, to be negatively correlated with stated interest rate, with only the Northeast (Region I) as an exception. This is intuitive, and reinforces the notion that Credit Unions generally do a good job of pricing loans based on risk. Finally, on average, you can see that credit deterioration is largely minimal, and that Regions II, III, and IV are most affected by credit quality deterioration. What have we learned? In 2016, used autos have shown increased collateral risk factors. Although collateral risks and low yields are something to keep an eye on, strong demand and credit quality mitigate the risk of an auto bubble bursting. As has been well documented in this blog, the used auto market has seen increased levels of depreciation since Q3 2015. In fact, it is likely by the time 2016 has finished, we will see auto values deteriorate at the same levels seen during the Great Recession for the second straight year. I won’t go into the weeds of the factors that contribute to these market conditions again, but as you can see in the chart below (as reported by BlackBook Lending Solutions), in the 12 months made up of Q4 2015 through Q3 2016, the average depreciation on autos has been 16.6% as compared to 11.1% in the previous 12 months. That’s close to a 50% increase in value loss year-over-year. However, supporting the premise that collateral values are softening on used automobiles, you can see that used auto LTVs in our analysis are, on average, noticeably higher than new autos. That is noteworthy because, the “% of current balance analyzed” is lower than the “% of total loans analyzed” in used segments. This suggests that average balances on used cars are lower proportionately to the number of used auto loans outstanding – yet another signal of lower collateral values. What have we learned? As discussed in a previous blog on this site, housing, although with nominal prices at an all-time high nationally, is still relatively more affordable compared to the run-up to the mortgage crisis of 2008 – 2009. Strong values are also propped-up by the low interest rate environment, which at least for the foreseeable future, isn’t drastically changing. The housing market rebound continued in 2016. In fact, median home prices reached an all-time high as seen by the black dotted line in the graph above. Each NCUA Region has seen median home prices increase from 2015, with the West, Northeast, and Mid-Atlantic regions performing the strongest. The biggest gains in housing have been seen in Region V (western states) which saw a 7.6% average increase in housing from Q1 2015 to Q1 2016 mainly driven by double digit growth in Nevada, Oregon, and Washington. Values in the Southeast (Region III) and Plains/Mountain states (Region IV) lag national averages, but, as seen throughout all regions, are actually approaching all-time highs, as well. Not unlike the auto market, originating FICO scores are strong on real estate. First Mortgage borrowers have actually seen an improvement in credit quality throughout the amortization of their loan, and Home Equity borrowers have seen only a slight bit of deterioration on average. Real estate loans, as expected, account for the larger balances within the average lending portfolio accounting for only 9% of the total loan count, but close to 50% of outstanding balances, on average. What have we learned? Employment is obviously a huge consideration when thinking about lending and loss, and it is clear that in regards to employment and income, the lending environment hasn’t been stronger since before the recession. As seen above, the national unemployment rate ended 2015 at the lowest level since 2007 at 5.0% nationally. In the chart above, you can see how far we have come since the aftermath of the Great Recession (officially lasting from December 2007 to June 2009) In 2016, unemployment has remained steady, and at least from a raw unemployment perspective, the job market has fully recovered (although depending on the numbers you look at, this is debatable). Regionally, the West and Southeast states exhibited the weakest employment outlook in 2016. But to put “weakest” in perspective, both of those regions are still below 6% unemployment. Unemployment has decreased in every region each year since 2009, but perhaps more importantly, after so many years of stagnant wages, the tightening of the unemployment rate has also resulted in an uptick in wage growth. So far, observed wage growth has been over 3% in 2016. 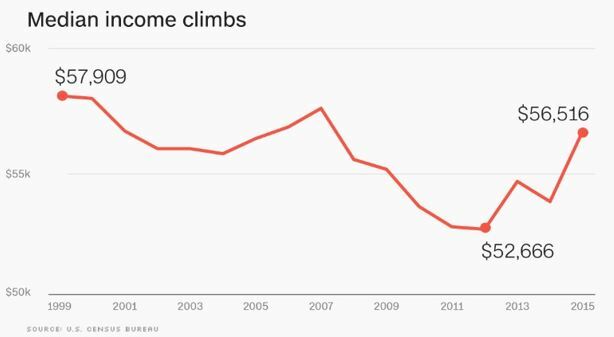 This, coupled with 5.2% income growth from 2014 to 2015, is a much needed raise to the American workforce that is finally seeing incomes re-approach 1999 levels. Judging by the data at our finger tips, 2016 has appeared to be a strong year for lending. Macro-economic factors such as robust housing markets and strengthening employment factors have supported strong financial conditions. As such, all NCUA regions exhibited solid credit indicators at underwriting and very little deterioration in credit quality. Yields appear that they will remain low for the foreseeable future, and the auto market may be tougher sledding in the near future than it has been in the recent past, but, overall conditions appear favorable for lending based on 2016 data. If you are interested in a deeper-dive specific to your Credit Union, Twenty Twenty Analytics specialize in loan-level portfolio analysis considering all of the factors that have been discussed. As a CUNA Strategic Service Provider, our team of specialized analysts have evaluated more than $500 Billion in consumer loans and manage more than $400 Million in commercial loans annually for Credit Unions throughout the United States. Our standard portfolio analysis includes an evaluation of credit quality, collateral position, and environmental factors that allow us to determine the risk position of your portfolio, and likelihood of future losses specific to your Credit Union. We would be glad to share our expertise and help you understand the risk factors pertinent to your business, just reach out to Alan Veitengruber or Dan Price for more information.